Over Christmas and new year I read The Life-Changing Magic of Tidying by Marie Kondo after hearing good reviews around the internet. This book is a little gem of inspiration if you are considering a big declutter in 2015. For me, it was a chance to glean some new tips on decluttering. 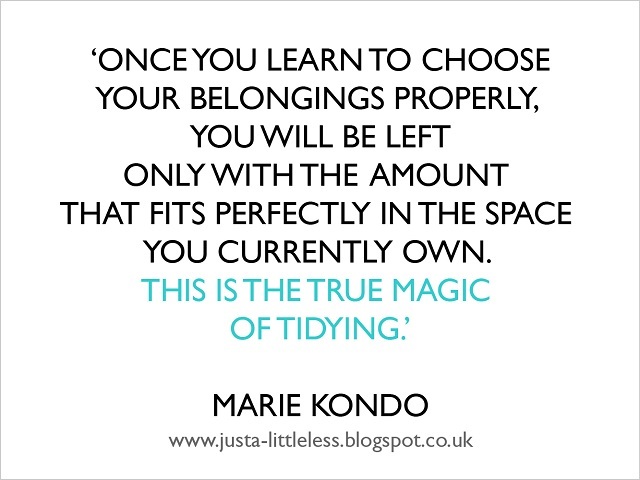 I like Kondo's organised and positive approach to the subject and her philosophy of treating possessions with respect. However, I'm not convinced that this book alone would help me to declutter my entire house from scratch as some practical information regarding timescales and how to actually discard items was missing. Also, whilst decluttering in one go sounds wonderful, I think there is wisdom in not rushing the process if you are not mentally prepared. Her folding methods are also beyond my clumsy hands but there are some KonMari folding tutorials on youtube should you wish to learn. To summarise, I would recommend this book as any new angles on decluttering and understanding why we hoard are useful. I have made a note of 20 tips that, in my opinion, sum up Kondo's 'KonMari' method. I know I will be trying out a few. How about you? 1. Putting your house in order should be done once only and in a single period of time. 2. Concentrate on discarding first. Don't get distracted by storage methods. 3. Tidy by category, not by place. 4. Begin by focusing on your motivation for tidying by visualising your ideal lifestyle and why you want to live like that. 5. Handle each item and consider if it 'sparks joy'. Keep only those items that you truly love. 6. Discard in a certain order starting with the easier categories first: clothes, books, papers, miscellaneous items and sentimental items. Within each category subdivide your discarding for extra efficiency. For example discard clothing in this order: tops, bottoms, clothes that need hanging, socks, underwear, handbag, accessories, sportswear and shoes. 7. Don't discard for other family members and don't force your discarded items on them. Begin by discarding your personal belongings and your example will set off a chain reaction of tidying in others. 8. Choose a quiet environment for tidying to encourage an internal dialogue between you and your belongings. The best time to start is early morning. 9. If you find something difficult to throw away, ask, “Has it already fulfilled its purpose?” Let these things go with gratitude. 10. Gather every item together from across your home and place on the floor. 11. Don't downgrade discarded clothes items for loungewear. 12. Keep storage simple. Folding clothes is the KonMari ideal storage method for clothes. The physical act of touching clothes as you fold them has a positive effect on clothes. She is anti stacking items preferring vertical storage. Shoe boxes are also recommended for storage. 13. Hang clothes by category and arrange them so that they rise to the right with heavy items on the left side. 14. Keep all your clothes ready to be used year round, regardless of season. 15. Set limits. For example Kondo suggests 30 books as her ideal number. Kondo talks about finding your 'Just right click-point'. 16. Be ruthless. Kondo applies this to paperwork and other miscellaneous items like spare buttons and unidentified electrical wires. 18. Empty your handbag everyday. 19. Celebrate letting go of your possessions. 20. Tidying is just the start. By questioning what 'sparks joy' and eliminating items that don't make you happy you can get closer to discovering your passion in life. This post was almost finished last week but was not published due to being at Dad's side. It has been quickly finished this morning and it feels good to post something useful and interesting for you. Many thanks for your messages about Dad. Support from you and others is so generous, restorative and moving. Quite overwhelming, really. Much love, Claire xo. I really liked this book and this approach - it definitely gave me some inspiration and new ideas. I loved the idea of asking if an item has already fulfilled its purpose and then being able to let it go if it has (I found this to be true in the category of books I think I'll read but haven't yet...I've had the chance, but have chosen to read other things instead). And the simple question..."Does this bring me joy?" is a great one to ask. What a great point regarding books! I'd never have thought of that, thanks. I really enjoyed this book, and I agree that sometimes decluttering needs to be done in one fell swoop. Otherwise it may never get done. I think from your list #2, 3, 6, and 14 were the most meaningful for me. I have done my whole house and got rid of tons of stuff. I still go through once a week and clear away or give away things. However, being a book lover there is no way 30 books would ever be enough for me. Thanks for taking the time to finish and post. I also read this recently and found it interesting and a bit different. You summarise succinctly. Some I liked, other things I wonder about. To each her own. My sympathy on your dad's passing and much strength for this difficult time for you and all your family. Your heart must be very full just now. I'm loving using this unusual and perceptive (and quite funny) book. I've done clothes and books and am just starting on paper - and sparking so much joy I might catch fire! (Well let's just say I find it energising.) Thanks for sharing it..
Claire, I've just received my copy from the library and excited to read it. I liked your take on things. I've been simplifying my life and posessions now for 3 years, which has been a bit of a challenge with a home here in the US and in the UK. Retirement is just a few years away and then we will live full time in Devon. I have found that although I have minimized drastically, I still have retained items for the future abroad. In reality, I know many things are different such as electrics and mattress/linen sizes. I didn't think I had saved anything "just in case" until I read your overview. My subconscious mind isn't yet a minimalist! Looks like I still have some work to do :) Love to you and your family during this difficult time. Thank you for taking your time to post and share with us. You are a treasure! Thinking of you so often Claire and your family, particularly your mother. I remember so vividly when my father died everything seemed so unreal without his presence but I learned that he is always with me in my heart and thoughts. Thank you for summarising Marie Kondo's book. It's always good to hear other ideas about de-cluttering and like the statement about discarding first and not being distracted by storage methods. So glad you were able to be together as a family at this important time. It matters, and it makes a difference. I've not commented before but have been reading your blog for a few months now. Thanks for all the interesting posts. They too make a difference. Putting your house in order should be done only once and in a single period of time ? Does this person never buy anything ever again? I did agree with " be ruthless". If you are a person who holds on to stuff, you are never going to reach your goal if you can talk yourself out of giving things away. Instead of saying" I'm going to start and de-clutter" ...just do it. Its actually very liberating. It seems like an inspiring book. I hope it can help out a lot of people who are struggling with hoarding and organization. It’s good to know that the tricks you got from it actually worked for you. Thanks for sharing us everything that you learned from it! I read this book last week and began my "tidying" yesterday. I really needed to see all the clothes I owned to identify those I really loved. I respectfully thanked and said good by to the rest and I felt energized. I am happy to share those clothes with others who can love them more!